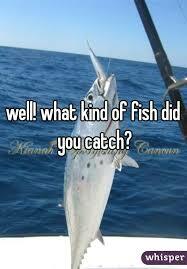 BNI of the Heartland: WHAT KIND OF FISH DO YOU CATCH? leading the training put an analogy out that sparked an idea for a blog. He was talking about hooking your clients and how much effort you are putting in, and he used a fishing concept. So I am going to expand on that as it pertains to you and your chapter. When you give your weekly presentation or feature presentation how prepared are you? When you go to your meeting, do you bring a referral, or do you pass referrals that come to mind during the meeting? Twist on the last question, do you only get referrals from your weekly presentation, or from one to ones and referrals passed before the weekly meeting? All of this comes down to how prepared you are when you meet with other members, be it at the meeting or in a one to one. So let’s look at some different situations when a person goes fishing. This sounds silly right? Well, if you are attending your meetings, not bringing referrals, and making up your presentations on the spot, what do you plan on getting out of BNI? If you just wait for a referral to fall in front of you at a meeting, you will probably never see any. Just like a fish jumping on shore. At least in this situation, the person has the tools to get a fish! The yellow slips in the meeting are Chapter Education Units or CEU’s. Just because the meeting provides you the structure and the opportunity to talk about your business, that does not guarantee referrals. Educating yourself on how to use BNI can show amazing results! Podcast, blogs (just like this one) trainings, everything offered from BNI to help you succeed is important to getting referrals. The better you understand how to use the tools of BNI the better your results will be. BNI is all about building relationships. The saying goes, people buy from people they know, like, and trust. Well Ty Bennet takes that one step further and says “People buy from people they know, like, trust, and VALUE” I rarely hear any fishing stories where you catch the big one on the first cast. Once you have the tools and the skills and the activity to be successful, next you need time put in. A lot of professions are more referable once the members understand what you do and how well you do it. When a BNI member values another member they don’t just bring referrals to the chapter, they go out and find referrals for the chapter. The more time you spend in building your relationships in BNI the more results you will see. This is the BNI dream story. But I hear all the time how the dream became a reality in BNI. I love hearing those stories!! When I ask how it happened it is almost always the same answer, they worked BNI to have BNI work for them. They did training and CEU’s to know better on how to invite visitors and how to find referrals for other members. They put in the time and stayed committed to their chapter and helped in any way they could. But most importantly they were prepared for every meeting and every one to one, so they could maximize the time and focus on referrals and referral opportunities. For some of you that “big catch” may feel far away or impossible, but the more time and effort you put in to growing your business the more business you will see. Let BNI be one of the tools you can use to help keep you focused, to help hold you accountable, but most importantly to help you help others. Givers Gain.